Home » Out-of-place artefacts » Anomalous human remains » Oldoway man: a Middle Pleistocene Homo sapiens? Oldoway man: a Middle Pleistocene Homo sapiens? In 1913, Olduvai Gorge lay in Deutsch-Östafrika (German East Africa), now Tanzania. It was only natural that German academics should work in their colonies. In that year, Professor Hans Reck (1886-1937) of the Humboldt-Universität zu Berlin (Humboldt University of Berlin, at the time known as Universität unter den Linden) was shown a skeleton embedded in rock on an east-facing slope of Olduvai Gorge (actually, the Masai name is Oldupai, while Oldoway was the spelling used in Deutsch-Östafrika). The workman who had discovered it had begun to chip away the concreted sediment from around it and Reck decided to lift the entire block containing the bones. This was the first discovery of ancient human remains in the Gorge, which was to become the scene of major discoveries in later years. Reck was primarily a palaeontologist, accustomed to working with fossils. The fact that the bones were in a highly compacted deposit led him to think that they were of great antiquity. This was backed up by his analysis of the geological sequence in the Gorge. The skeleton was removed from his Bed II, which he dated to more than 150,000 years ago. 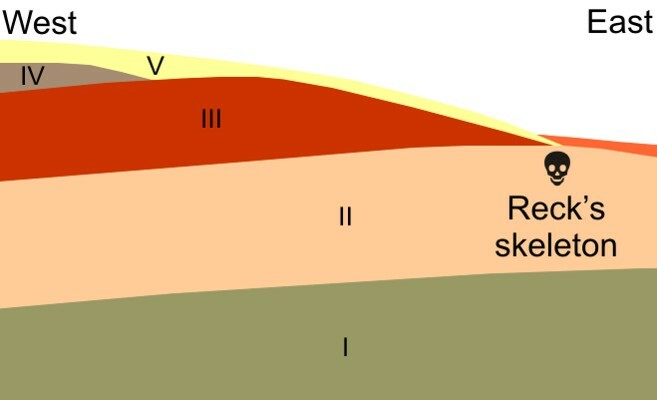 The deposit is a buff sediment, becoming redder above a discontinuity; this upper level, where the skeleton was found, is fluvio-lacustrine in origin. In other words, it was laid down in river and lake beds. The skeletal remains included a complete but distorted skull, containing 36 teeth rather than the usual 32. Reck took this to be a ‘primitve’ and therefore early feature of the skeleton. The deposit was so hard that the bones had to be removed with hammers and chisels. Fossils of an extinct elephant, Elephas antiquus recki, were found in the sediments below the level of the skeleton. This led Reck to conclude that the deposit was dated to the Middle Pleistocene. Realising that the discovery of Homo sapiens remains in a deposit of this date would be controversial, he set out to establish whether or not the skeleton belonged to a later burial. He was unable to distinguish evidence for a hole dug into the layer that might have been a grave cut. It was partly thanks to the controversy surrounding this discovery that the young Louis Leakey (1903-1972) became fascinated with the Olduvai Gorge site. Reck’s skeleton soon became notorious because its age could not be established satisfactorily. As Reck could not return to the site (the United Kingdom acquired Germany’s African colonies after the 1919 Treaty of Versailles), Leakey began his lifetime’s work there. 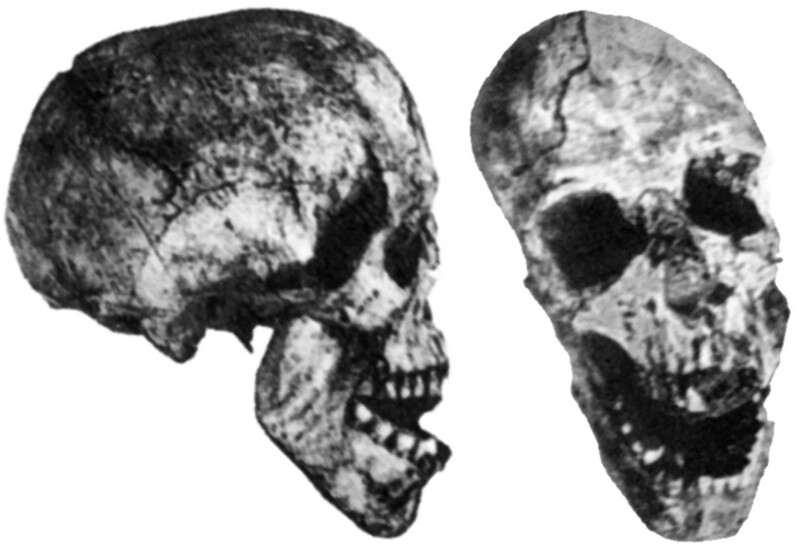 By 1932, the idea that a Middle Pleistocene Homo sapiens had been found at Olduvai had unravelled completely. Why? Bed II is considerably older than Reck had estimated, but is a deposit that contains numerous Lower Palaeolithic remains. These include Oldowan tools, the earliest technology developed by hominins. They also include the remains of the hominins themselves. Not one discovered since 1913 is of Homo sapiens, though. Instead, this is the bed in which early discoveries of fossils belonging to Homo habilis (known as OH 13 and OH 16, but nicknamed Cindy and George) were made. Reck had believed that the deposits above the skeleton were undisturbed. However, the skeleton was in a contracted position and virtually complete. This is very different from the usual condition of hominin fossils, which tend to be of body parts rather than complete skeletons. This is made all the more complicated by the fact that the Bed II deposits are water-lain, as Reck had established. A body falling into water will either be dispersed by the movement of water or by scavenging animals, unless it is covered rapidly in silts. It is very unlikely that a corpse falling (or even being laid) in water would remain in a contracted position before being covered in silt, no matter how rapidly it had formed. The difficulty with accepting Reck’s skeleton as being as old as he claimed is that his work was done without any appreciation of archaeological stratigraphy. Although the deposit was of Middle Pleistocene date, geological analysis of the material surrounding the skeleton showed it to contain red pebbles and limestone chips. These are not found in Bed II, but occur higher up in the sequence, which shows that they are later than it. This makes it certain that the skeleton was intrusive. In other words, it lay in a grave cut down from a higher layer. Reck himself came to accept this explanation. The ancient date was dismissed by Percy Boswell (1886-1960) in a letter to Nature (13 August 1932: “The Oldoway Human Skeleton”, volume 130, pp 237-8). The notoriously stubborn Louis Leakey agreed with Boswell’s critique. Had there been anatomically modern humans at this date in the Gorge, we would expect to find other remains in Bed II. As we do not, we must question Reck’s original judgement. Most estimates now put the burial at around 20,000 years old. The ever-useful TalkOrigins website contains a useful (and fully annotated) rebuttal of the claims. 7 Responses to Oldoway man: a Middle Pleistocene Homo sapiens? You say that creationists claim the “Oldoway” remains are a million years old. Am I missing something? Admittedly, I really don’t pay much attention to creationists, but I thought they believed the Earth was created in 4004 B.C. or something like that. The accusation that stratograghy was not performed correctly conflict with the original reports.Leakey backed Reck until the disgruntled peer review insinuated threats against Leakey’s upcoming review if he did not stop backing Reck.One peer review rejected Recks finding based on his belief in the authenticity of piltdown man.I would urge everyone to read the original reports along with the criticism of the peer review board which is reprinted in “forbidden archeology”.No, it is NOT a “creationist” book.It is just compilation of all the facts and the truth of how they mishandled and mistreated by scientist who are supposed to be unbiased. At first it Leakey thought exactly what the debunker above claims, that it was either a part of a different strata or that it was buried from an earlier time into the strata below. However, after Leakey and Reck studied the skeleton within the rock he found no evidence suggesting a burial (the soil would have been mixed up in that area with soil from above, and this was clearly not the case). Leakey then changed his view and backed Reck. He only changed his position again after another archeologist (who may have had a definite bias since the books he was writing would have been blown out of the water by such a find) supposedly found the red pebbles that Leakey and Reck had somehow missed in their own careful analysis. It is quite possible that Leakey may not have wanted risk his career to go down the tubes due to this and eventually caved under pressure. As mentioned above by Joe Fleeman he faced a hostile peer review if he did not stop backing Reck. The claim that there have not been other artifacts to support the existence of a skeleton like this is also false. The problems seems to be that if something doesn’t fit into mainstream views or paradigm at the moment – it cannot exist or be correct. It’s just too mind blowing. The term “creationist” is somewhat misleading, and is unfortunate. The bible unequivocably proclaims that all things were created by God. The age of the earth proper is nowhere mentioned; the bible does however state that time is immaterial with God. One interpretation of the seven days of creation as in Genesis is that of 24 hours per day; however, apart from in the Law, there is no other reference in the Bible which emphasizes that God created all life on the earth in six calendar days. The sequence of the “days” fits a true biological rational approach. Hope this helps. No. The point I’m making is that some creationists have said that, using the standard dating criteria, the skull would have to be a million years old. It clearly isn’t. In creationists’ arguments, demonstrating that evolutionary claims are false is a means of proving the correctness of creationism. This is a false dichotomy. I need to rewrite this page to clarify my over-hasty writing. As far as i read and found out (being paleontologist myself) the finds of those early pigs remains and the stratigraphy show that the skeleton Reck would be indeed around 500,000 years ‘old’ IF you compare it to the strata – however there are sinkholes, where skeletons of all kinds may end up, then to be filled with limestone or rubble, which was not known at that time though. To accuse a researcher from before 1914 to not know about that or follow modern archeology/ paleontological methods is a bit harsh. Remember what Schliemann did, and what Evans did in Knossos (the latter had indeed been ‘found’ by Schliemann, but he gave up acquiring the area due to the turkish seller, raising his price from day to day). Kattwinkel and Reck had found ‘Olduway’ but WW1 and the loss of Tansania then stopped further research. Reck also found more recent activity of melting iron and even about production of steel, which has nothing to do with the skeleton found.